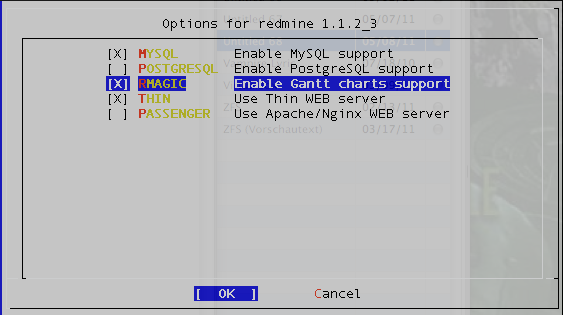 Here's my short primer on setting up Redmine on FreeBSD. In my case, I just wanted a rather simplistic and stripped-down environment, which was the reason to choose Redmine. While it can perfectly integrate with Apache, Nginx and other web-servers, I preferred to use the minimalistic "thin" web-server. Redmine requires a database server. Either MySQL or PostgreSQL or sqlite. Then install Redmine from /usr/ports/www/redmine. Enable the services in your /etc/rc.conf. redmine_flags="-a 0.0.0.0 -p 3000 -e production --ssl --ssl-key-file=/usr/local/www/redmine/config/server.key --ssl-cert-file=/usr/local/www/redmine/config/server.crt"
redmine_flags="-a 0.0.0.0 -p 3000 -e production"
Fire up the mysql console. For Redmine you'll need to edit some configuration files at /usr/local/www/redmine/config first. First copy the "database.yml.example" file to "database.yml". # re-generated from your development database when you run "rake". # Do not set this db to the same as development or production. I enabled SSL for the "thin" web-server in /etc/rc.conf. If you choose to not use SSL, skip this step. To enable SSL, you need to create the SSL private key and a certificate. I'm giving just the command list here, as this procedure is otherwise very well documented over there at the mod_ssl FAQ. The above procedure would essentially create a password-protected key (step 1), which would then get the password removed (step 2). I'd then create a signing request in the 3rd step and have a self-signed certificate created (last command). The removal of the password is essential to start the web-server without prompting for a password. Now, there was just one little cave-at I came along. On my setup, Redmine would not properly run in SSL mode in some cases create redirect url containing http:// instead of https://. I suspect this is a problem caused by the "thin" web-server, which would not properly state that it runs in SSL mode to the application. Obviously, wenn running "thin" in SSL mode, it would no longer word in "http plain" mode, so this causes some errors. For example, when logging on to your host using https://HOSTNAME:3000, you'd get redirected to http://HOSTNAME:3000/login?back_url=http://HOSTNAME:3000". Now, as this obviously won't work, there's a little change required in the "/usr/local/www/redmine/vendor/rails/actionpack/lib/action_controller/request.rb" file. # Is this an SSL request? This will force Redmine into thinking it's permanently SSL enabled, thus it will always generate proper https:// URLs. This particular issue would propably not come up when using Apache or Nginx in SSL forwarding mode. Now you're basically done. Start accessing Redmine through https://YOURHOSTNAME:3000 (or http://YOURHOSTNAME:3000, in case you left SSL disabled). And don't forget to change your default username/password settings upon first login.